St. George, Utah in Washington County is an enchanting landscape of towering red rock cliffs and canyons, blanketed in a thin peppering of desert sage. One of the most prestigious luxurious master-planned golf club communities in the state, Entrada at Snow Canyon, mastered the art of designing a community that complimented, honored, and incorporated the natural landscape into its design. 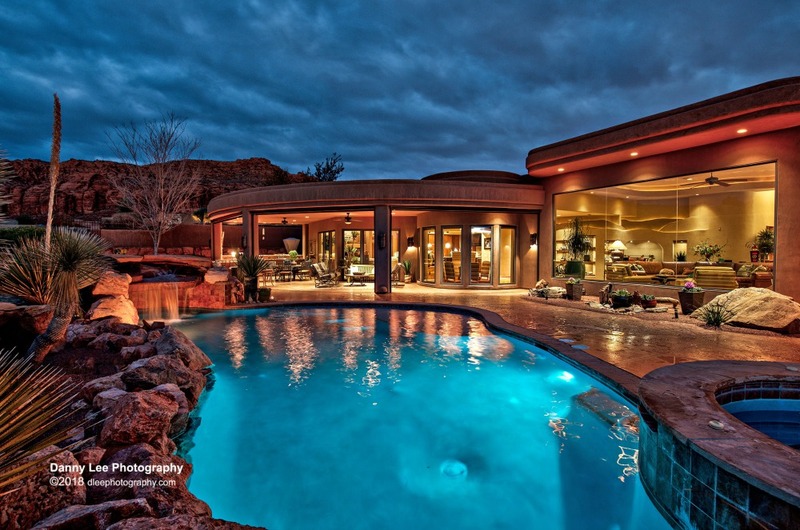 Within Entrada at Snow Canyon is the affluent neighborhood of The Cliffs at Snow Canyon, a neighborhood in which each home presents the gift of 360-degree views of Snow Canyon State Park, Entrada Golf Course, The Red Cliffs, and Tortoise Reserve. The Cliffs of Snow Canyon is a private, gated community situated ideally at the cusp of Snow Canyon state park, The Red Cliffs, Entrada golf course, and the surrounding tortoise reserve. Imagine being neighbors with an extinct volcano and the diverse topography of Snow Canyon State Park. The neighborhood is complete with community swimming pool, spa, and a clubhouse for entertaining as well as an exercise room for keeping fit. Furthermore, homeowners at The Cliffs of Snow Canyon have the option to enjoy social membership to Entrada for additional amenities and social gathering opportunities. Residents who want to take the golf community lifestyle to the next level take advantage of the full membership options to Entrada at Snow Canyon for all the perks, bells, and whistles that come with the full Entrada membership. Play golf on one of the best courses the country has to offer, amidst stunning views, and then enjoy a meal and an adult beverage at the on-site restaurant. There’s also a community calendar for Entrada members chock full of community events and social networking opportunities to gather and enjoy the company of your peers. Homes situated within the neighborhood of The Cliffs at Snow Canyon are custom homes crafted by a variety of architects and builders including Brian Beer Construct and C. Blake Home. Designs take full advantage of the stellar background, including floor to ceiling windows with panoramic views like none else on earth. Conveniently located, residents living within The Cliffs at Snow Canyon are moments away from hundreds of recreational options including dining, shopping, spas, hiking and biking tours, and all the offerings of St. George and surrounding areas. Plus, The Cliffs at Snow Canyon is just a two-hour drive to Las Vegas, Nevada. To summarize, The Cliffs at Snow Canyon offers a luxurious lifestyle steeped in comfort. Expertly crafted expansive homes are built with top-of-the-line building materials and smart design. Residents enjoy panoramic views of some of St. George’s most spectacularly scenery including rolling dunes, lava beds, sandstone cliffs, and red rock mountains. The gated neighborhood is tucked within one of the most prestigious residential communities the state has to offer, which is structured around an award-winning golf course. Residents enjoy social membership to the Entrada clubhouse where they can access additional amenities other than the swimming pool, spa, and fitness center within the confines of the neighborhood. The lifestyle of The Cliffs at Snow Canyon leaves nothing to be desired.